Learn about climate action and sustainability in the gaming industry with Climatepedia! 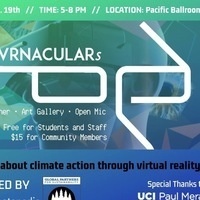 We'll have virtual reality demos and a discussion with VRNACULARs, followed by a climate art gallery, open mic, and dinner. This is open to the public to promote climate change solutions.